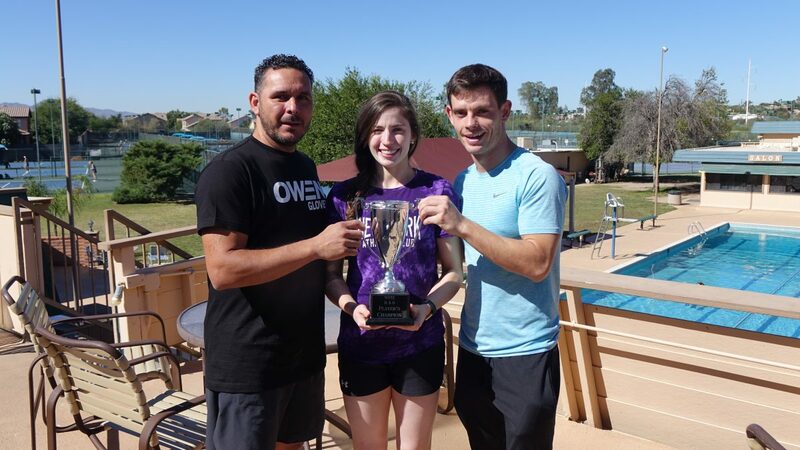 Tucson, AZ, WHP Press, 11/4/18- The World Players of Handball was proud to honor Catriona Casey as the 2017/18 WR48 Player’s Champion and Player of the Year on the first day of the 2018 Tucson Memorial. Catriona would add her 16th WR48 title and first Memorial title two days later. Casey has written the WR48 record books, winning 16 of the 18 WR48 events held since the inception of the tour in 2013, while being the only WR48 pro to have played in every event. Casey has completed two WR48 seasons with a 4:1 scoring ratio, a testament to her world-class skills, discipline, and passion for the sport. Casey has flown more than 150,000 miles in her 18 trips to WR48 events, making her not only the sport’s most winning champion, but also the sport’s most frequent flyer.